Top-quality New York-style hot dogs. And more dogs. And free toppings, including Polish sauerkraut. And did we mention the hot dogs? Please note, Big Apple Hot Dogs is now operating out of Cole & Son’s Deli on Caledonian Road. Time Out Food editors, July 2018. Hot dogs: much maligned by those who care about what they eat due to their uncertain provenance and comical appearance. The fact they’re also known as ‘wieners’ doesn’t help. But here to save the skin-clad meat tube from ignominy is Big Apple Hot Dogs, formerly a mobile cart (which started out on Old Street) and now in its first permanent spot. 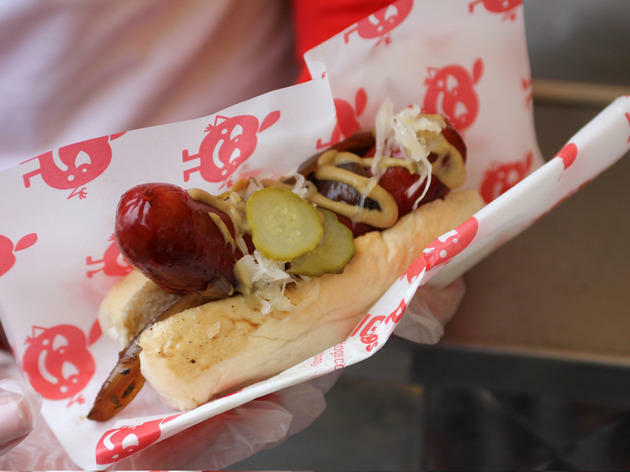 The company uses specially commissioned sausages made from free-range pork and buns baked by a local bakery. There are various sizes and meat combinations (pork, beef, pork and beef) and the full range of expected condiments that are guaranteed to be decorating your top before the last bite. 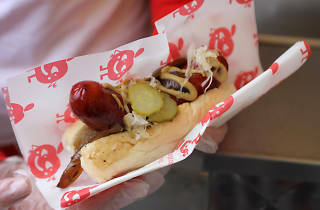 And the taste is a revelation for those who would normally avoid hot dogs – coarsely meaty, flavoursome and evocative of baseball games, world's fairs and competitive eating. Delicious. I tried to go to Big Apple Hot Dogs today but they have sold up and moved. They have sold their product to the bar next door (Road Trip) where I had a big wait for the food whilst the waiter had a cigarette and a chat with his friends. When the food came however it was very tasty! ....a not bad 3 stars from me!! I think these used to be better, or maybe I’ve just eaten a lot of dogs this year. Either way they are still really good and you should check them out. The Big Frank with the onions smothered in mustard and ketchup is the order to go for, wash down with beer and belch a bit for the full experience. These guys pop up on various food markets and some how I think they taste better outside (fairground nostalgia from being a kid probably!). Cheap as chips for a tacky dinner on the go its dead good. Road Trip told me they just heated hot dogs in the back. Didnt know about any toppings at all (place was empty, i spoke with the chef), gave me tommy k and mustard, sausage was really good, cost more than Big App HD website says (below comments reinforce this). Emailed Big App Hot Dogs to let them know how badly their once Stall product is being run, had a response saying they will look into it and would i like to come to their new office (when its ready, they will be intouch) and have a comment / tasting experience. 2months later iv heard nothing, just sent email seeing if they are alright for me to come in for a visit and if they wanted my advertising / media friends to come too as they are in the food and advertising business. Customer service went from 100% to accusations of not caring for the business, trying to get my friends a free meal and this personal comment "But I suspect you have had very many disappointing experiences and will continue to do so". This gets one £ as value, £8.50 for a good hot dog in a bad bun with nothing but tommy k and mustard. Not good value. THIS HAS WORNG INFORMATION ON IT! The hot dog is tasty and so were the onion rings BUT very disappointed to see all the info they have in their website to be a lie. I am a small girl and a big hot dog is not even close to enough for a meal, prices are different than website, the wide variety of "free" toppings doesn't exist at all, if you want fried onions and gherkins on top let them know and pay for it. They give 1 type of mustard and a tiny tiny bit. Frederic's review is a bit of a shocker...first bad review of Big AppleHot Dogs I've read. Oh well you can't win them all... I hope you spoke to the vendor... I am sure they would reimburse you for any below par product. I've had Big Apple's hot dogs several times at the Kerb event in front of the Gherkin (more appropriate a place to serve burgers?) [ http://www.kerbfood.com/gherkin/ ] and last week was doubly disappointing. I had their double-header, two thin franks in a bun, and the filling was full of chewy bits. They go to great lengths to tell you how they carefully select the meat so this came as a nasty surprise. I've had their Big Pole before as well, and it was quite good, but now I'm really wary to try it again. What a big let-down, Big Apple... I'll give you two stars for past services rendered. Saw a recommend for you on the Mark Wright TV show July 22 or 23 what are your other locations? venues and times , How about Camden Lock, . By the Bridge,...or next to the Hawley arms.....or inside the Stables Market.,,,,,Check it out,...you gotta get up there. Let me know when you do. I really miss a good hot dog. Its the first thing I do when I get over to NY. Stuff a couple of dogs. Serious flavour! Caught one at Eat St in Kings Cross. Will be back. Awesome hotdogs, great for a quick lunch. Big Apple Hot Dogs rocks!!! Excellent food and the guy who runs it is such a nice chap to chat with. Had a saussie here the other day. Great . Well recommended for a snack on the go.